Wanda Ruby Ann White (nee Deschamps), 76 years of Nipigon, Ontario passed away peacefully but unexpectedly with her loving family by her side on Tuesday, August 30, 2016 at Southlake Regional Health Centre in Newmarket, Ontario. Wanda was a member of the Board of Directors of Kinna-aweya Legal Clinic for 30 years. 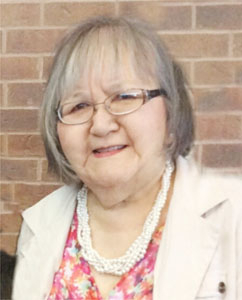 She was first elected in September 1986 to represent the Nipigon area. She was elected as President of the Board of Directors in October 1989 and served as President continuously since that time. Wanda hired many of the staff at Kinna-aweya Legal Clinic. She attended the provincial Association of Community Legal Clinics of Ontario’s AGM for many years. She was a guiding force of the legal clinic and she will be missed by us all, Board members and staff alike. We will miss her stopping by the office to have her decaf coffee and chitchat with us. We will miss her friendship. Her guidance and wisdom will continue to guide us and her contributions to the clinic will be cherished forever.